10:48pm: The cash considerations going to Seattle in the deal are simply to offset the difference between Storen’s $8.35MM salary and Benoit’s $8MM salary, reports Bob Dutton of the Tacoma News Tribune (on Twitter). 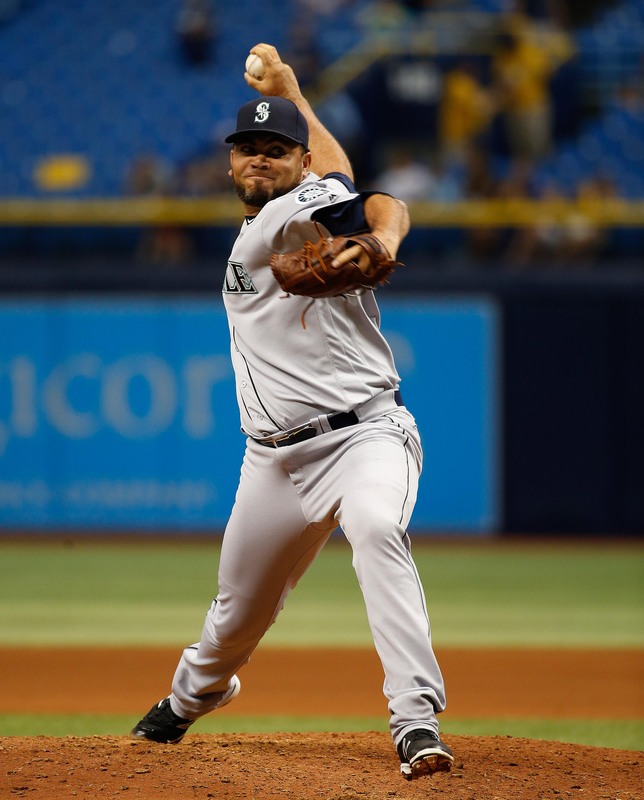 10:09pm: The Mariners announced tonight that they have acquired right-hander Drew Storen and cash considerations from the Blue Jays in exchange for right-hander Joaquin Benoit. Storen was designated for assignment by the Blue Jays over the weekend. The trade represents a swap of struggling veteran setup men, as each has posted an ERA north of 5.00 this season. 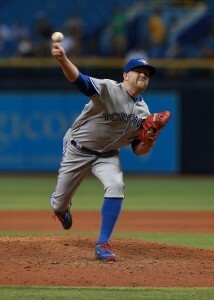 Storen’s struggles have been more pronounced, as the former Nationals closer has posted a 6.00 ERA in 33 1/3 innings for the Blue Jays this season after opening the year as the top setup man to sophomore closer Roberto Osuna. Storen has posted a very solid 32-to-10 K/BB ratio in that time and delivered a strong 47.2 percent ground-ball rate, but he’s also experienced a significant dip in his fastball velocity. After averaging 94 mph on his heater last season, Storen has checked in at 91.9 mph in 2016. He’s thrown his four-seamer less often, swapping it out for an increased reliance on his sinker — hence a nearly nine percent increase in his ground-ball rate — but home runs have plagued Storen this year. Over the life of his career, he’s posted an 8.2 percent homer-to-flyball ratio, but that number has more than doubled to a whopping 17.6 percent this season. The shift to the American League East and, more specifically, the homer-happy Rogers Centre, has perhaps contributed to some of the increase, but a rate that high is almost always due for some regression. Abandoning the current launching pad in which he pitches his home games should do Storen some good, especially when considering that he’ll move into the spacious confines of Seattle’s Safeco Field. Benoit, meanwhile, has pitched to a 5.18 ERA across 24 1/3 innings in that decidedly more pitcher-friendly environment. Unlike Storen, his velocity is holding strong at age 39 (today is his birthday), but Benoit has seen a significant increase in his walk rate. Benoit experienced some control problems earlier in his career, but he averaged just 2.6 walks per nine innings from 2010-15 as he established himself as one of the game’s more reliable late-inning relievers. In 2016, however, he’s walked 15 batters (one intentional) in 24 1/3 innings and also hit a batter. Those 15 walks are just eight fewer than the 23 total walks he issued in 65 1/3 innings last year, and they’re actually greater than the 14 free passes handed out by Benoit in an excellent 2014 season that saw him throw 54 1/3 innings with the Padres. Benoit, too, has had some uncharacteristic struggles with the long ball, but the control and an inability to strand runners have been his biggest flaws. From a contractual standpoint, each player is a free agent at season’s end. Benoit is earning $8MM to Storen’s $8.35MM this season, so the cash considerations that are exchanging hands in this deal are fairly minimal. In some respects, this trade is reminiscent of a swap that Mariners GM Jerry Dipoto made in his days as GM of the Angels, sending struggling closer Ernesto Frieri to the Pirates in exchange for their own underperforming ninth-inning arm: Jason Grilli. Essentially, the trade boils down to a swap of comparably priced assets that had faltered in a similar role despite lengthy track records of success — albeit with other organizations. Both Storen and Benoit were in the first season with their respective, now-former teams, having each been acquired in an offseason trade. Toronto sent Ben Revere to the Nationals in order to acquire Storen, who had spent his entire career to date in Washington. The Mariners picked up Benoit in a trade that sent minor leaguers Enyel De Los Santos and Nelson Ward to the Padres. Entering this season, Storen had a career 3.02 ERA with 8.6 K/9 against 2.6 BB/9 in 334 innings with the Nationals, who selected him 10th overall out of Stanford back in 2009. Benoit, on the other hand, reinvented himself with the 2010 Rays after shoulder surgery caused him to miss the entire 2009 season. From 2010-15, he pitched to a brilliant 2.35 ERA with 10.0 K/9 against 2.6 BB/9 in 379 innings for the Rays, Tigers and Padres. The Blue Jays have designated right-handed reliever Drew Storen for assignment, Barry Davis of Sportsnet was among those to report (Twitter link). To take his roster spot, the team has recalled fellow righty reliever Ryan Tepera from Triple-A Buffalo. Storen’s designation is the latest chapter in a disastrous 2016 for the 28-year-old. After Storen served as a reliable option for the Nationals from 2010-15, the Jays acquired him for outfielder Ben Revere in January and hoped he’d add a quality arm to their bullpen. Storen went on to throw 33 1/3 frames of 6.21 ERA ball in Toronto despite posting quality strikeout and walk rates of 8.64 and 2.7 per nine innings, while also generating grounders at an above-average clip (47.2 percent). A sky-high home run-fly ball rate (17.6 percent, well above his career mark of 8.2) and a drop in velocity helped lead to Storen’s undoing with the Jays. Given his track record in Washington, where he picked up 95 saves and compiled a 3.02 ERA, 8.65 K/9, 2.59 BB/9 and 44.9 percent ground-ball rate, Storen seems likely to catch on elsewhere for the stretch run. If he clears waivers and signs with another team, that club would only be responsible for a prorated portion of the league minimum. Aside from that figure, the Blue Jays would be on the hook for what’s left of Storen’s pricey $8.375MM salary. The Diamondbacks made one of the offseason’s most criticized moves when they sent a significant haul of young talent to Atlanta for right-hander Shelby Miller. One month into the season, the deal looks even worse for the Diamondbacks than its detractors thought it did at the time. Two of the players they gave up, righty Aaron Blair and shortstop prospect Dansby Swanson, have gotten off to impressive starts in the Braves organization. Miller, meanwhile, threw 19 2/3 innings in April and yielded 19 earned runs while walking one fewer hitter (15) than he struck out (16). Regarding Miller’s early difficulties, D-backs general manager Dave Stewart told MLB Network Radio (Twitter link) that expectations are weighing down the 25-year-old. “Shelby Miller is really just feeling some pressure of the trade,” Stewart said. Blue Jays reliever Drew Storen’s horrid April (eight innings, 14 hits, nine earned runs) won’t deter John Gibbons from continuing to rely on him, the manager told Ben Nicholson-Smith of Sportsnet. “I plan on just throwing him out there. You’ve got to. Otherwise you’re not very good if he’s not a key guy. The good ones, they all learn how to survive and make adjustments,” Gibbons said. As Nicholson-Smith notes, Storen’s average fastball velocity fell from 94 mph last year to 91.9 in April. On the bright side, he struck out seven batters against just one walk during the season’s first month. Cuban right-hander and offseason Dodgers signing Yaisel Sierra made his U.S. debut Saturday in a Single-A start and struck out seven hitters in four innings, though he allowed eight base runners (six hits, two walks) and three runs, according to Pete Marshall of the San Bernardino Sun. Sierra’s fastball sat in the low 90s and topped out at 94, which is the normal range for the 24-year-old. “I wasn’t good, I wasn’t bad,” he said of his performance. Dodgers left-hander Alex Wood had his best start of the year in a 5-1 loss to the Padres on Friday, throwing seven innings of five-hit, one-run ball while striking out nine and walking one. Wood’s encouraging outing came after a few days of working on a mechanical adjustment, writes Jack Baer of MLB.com. Wood’s delivery became easier to repeat, leading to better command, as a result of lowering his foot during his stride. “When I stride out, my foot off the ground has been fairly higher than it has been in the past,” he said. “It’s something that I thought was the last piece of the puzzle, in terms of my timing and getting my consistency back.” Wood’s performance against the Padres dropped his season ERA from 6.00 to 4.82 and increased his K/9 from a paltry 5.1 to 6.75. Rays closer Brad Boxberger continues making progress in his recovery from core muscle repair surgery on March 17 and should return to the majors later this month after a rehab assignment, per Marc Topkin of the Tampa Bay Times. Boxberger went 41 of 47 on save opportunities last season and put up a 3.71 ERA, 10.57 K/9 and 4.57 BB/9 in 63 innings. Blue Jays GM Ross Atkins had to hit the ground running after joining club president Mark Shapiro in moving from Cleveland to Toronto. He gave an interesting interview with Richard Griffin of the Toronto Star about the transition. Among other things, Atkins says he has been impressed with the level of minor league talent still in place despite the significant trades swung by former GM Alex Anthopoulos. It doesn’t appear that the Blue Jays have any further extension talks lined up with slugger Edwin Encarnacion during the final days of camp, Ben Nicholson-Smith of Sportsnet.ca reports on Twitter. That’s not terribly surprising, given that all indications are the sides were not able to gain much ground earlier in the spring. Still, it’s worth noting that many extension — particularly of pending free agents — come together just before the season opens. Roberto Osuna will open the year as the closer for the Jays, Shi Davidi of Sportsnet.ca tweets, meaning that the recently acquired Drew Storen will operate in the 8th inning. As Nicholson-Smith notes (also via Twitter), the Opening Day pen will include four other new additions: Gavin Floyd, Jesse Chavez, Arnold Leon, and Rule 5 pick Joe Biagini. Meanwhile, Toronto has settled upon Ezequiel Carrera as the team’s fourth outfielder to open the season, as MLB.com’s Gregor Chisholm tweets. He had been competing for the job with players like Darrell Ceciliani, Junior Lake, and Domonic Brown. Carrera, 28, owns a .259./.309/.349 slash with 27 stolen bases over 670 plate appearances spread over five MLB campaigns. The Blue Jays and newly acquired closer Drew Storen have agreed to terms on a one-year, $8.375MM contract, thereby avoiding arbitration, according to Ben Nicholson-Smith of Sportsnet (Twitter link). Toronto picked up Storen, a CAA client, in a swap that sent Ben Revere to the Nationals. His salary is a little less than five percent shy of MLBTR contributor Matt Swartz’s projection. Storen, 28, should anchor the Toronto bullpen this season — his final year before becoming eligible for free agency. The former first-round pick spent much of the 2015 season as Washington’s closer but accepted a demotion to a setup role when the team acquired Jonathan Papelbon. Storen recorded a 3.44 ERA with 11.0 K/9 and 2.4 BB/9 with 29 saves in 55 innings in his final year with the Nationals. The Blue Jays addition of Drew Storen will give the club the opportunity to stretch out Aaron Sanchez or Roberto Osuna as a starter, writes Shi Davidi of Sportsnet.ca. Toronto turned to both Sanchez and Osuna as relievers out of necessity in 2015, but they have previously been viewed as starting pitcher prospects. As GM Ross Atkins notes, there aren’t many success stories of players transitioning from the bullpen to the rotation (Carlos Carrasco comes to mind). Atkins hypothesizes that differences in how pitches are used and developed in a one-inning role are to be blamed. While Storen does give the Blue Jays some depth in the bullpen, they probably can’t afford to remove both Sanchez and Osuna from the bullpen. Even after adding Storen, Atkins continues to hunt for help in the bullpen and elsewhere on the roster, writes Ben Nicholson-Smith of Sportsnet.ca. “We haven’t let up for one second,” said Atkins. Acquiring additional bullpen depth would make it easier for the club to move one or both of Sanchez and Osuna out of the major league bullpen. They were linked to Fernando Rodney prior to the Storen trade. After high profile trades involving Craig Kimbrel and Ken Giles, the Yankees had some hope of receiving starting pitcher reinforcements for Andrew Miller. At this point, it appears as if the demand for elite closers via trade consisted of just two teams. While Kimbrel and Giles were dealt mostly for prospects, the Yankees had more interest in established talent. To me, this smells like a doomed proposition. Any team willing to pay top dollar for elite relief probably doesn’t want to trade away quality starting pitching. Now that the Yankees have added Aroldis Chapman, the plan may be to simply survive the early innings and let the bullpen slam the door. As such, Miller will probably stay put. The Yankees have also shopped Ivan Nova without finding a match. Nova is coming off a lousy, injury-addled season in which he posted a 5.08 ERA in 94 innings. He’s also in his final season of club control. Jennings views Nova as the best sixth starter on the roster, making him valuable depth. However, Jennings would happily trade Nova with a second player for a better pitcher.